The Peanutine, driven by a young boy - possibly Kenneth Norton. This small, peanut-shaped cart was pulled by donkeys along the beach selling a peanut confection to made by the Peanutine Company. Earliest records of the Old Orchard Beach area date back to 1653. The first settler, Thomas Rogers, established "Garden by the Sea "in 1657. A few years later ten militiamen repelled 150 attacking Indians near the beach, but a relief party of townspeople coming to support the militiamen were killed in an ambush, and Roger's home was burned. The "old" apple orchard, from which the town took its name, a landmark to sailors for many years, was on high land above the long sand beach. In 1820 Maine, formally part of Massachusetts, became a State by act of Congress. In that same year the first Publick House (inn) was opened serving coach travelers and other transients year round. In 1837, E.C. Staples was coaxed into taking summer boarders at his farm for $1.50 per week. Convinced of Old Orchard Beach's potential as a summer resort, Staples built the first Old Orchard Boarding House near the top of today's Old Orchard Street. 1842 brought the first steam railroad from Boston to Portland with a station just 2 miles west of town. The first restaurant to sell seafood treats and "shore dinners" opened in 1851 near Staples Street. The Grand Trunk Railroad opened in 1853 connecting Montreal to Old Orchard Beach, enabling Canadian visitors to flock to this closest beach to Montreal and avoid the long carriage trip. After the Civil War, which began in 1861, Old Orchard continued to grow with the building of new homes, streets, stores, livery stables, and beachfront hotels. 1873 brought the Boston & Maine Railroad passing right through Old Orchard Beach and stopping on the site of today's Chamber of Commerce. In that same year a group of Methodists formed the Old Orchard Campground Association. The Ocean Park Association built "The Temple" in 1881, and nationally known speakers were heard every Sunday all summer. In 1892 electric trolley cars replaced horsedrawn trolley cars to Biddeford and Saco. 1898 proved to be an unfortuitous year to complete the first Pier. Built of steel and measuring 1,770 feet long and 20 feet above the tides, the Pier was severely damaged in November of that same year by an early winter storm. 1900 brought the first town hall and 1902 the first amusement area complete with roller skating, merry-go-round, rides, games, and refreshment stands. The Portland to Old Orchard Beach Electric Railway opened in 1903 where 14 miles of track were traveled in under one hour for 20 cents. The great fire of 1907 destroyed the entire beachfront as firemen from Portland, Biddeford, and Saco rushed to the beach but struggled to contain the blaze, hampered by low water pressure. Rebuilding began at once, and one project "the standpipe" assured adequate water for all. March 1909 brought another damaging storm destroying "White City" at the end of the Pier and reducing the Pier to 700 feet. An international auto race was held on the beach in 1910 with Dave Lewis winning the 100 mile race. The 1920's and 30's were the Big Band era. All the famous dance bands, Guy Lombardo, Rudy Valle, Duke Ellington, and more visited the Pier Casino each summer, and thousands danced over the waves under the revolving crystal ball. Sparked by Lindbergh's daring flight, many Trans-Atlantic flights took advantage of Old Orchard Beach's long stretch of wide hard packed sand to attempt their own crossings. The storm of February 1978 almost demolished the Pier, and a new pier was immediately planned. Today's Pier opened in June 1980. 1. 1550 - The beach was famous to the Redman long before the white man came to America. All the tribes of Eastern Canada & Maine arrived at the beach on June 24th: believing that "All who step into the waters will be cured, the lame made straight, the sick made well, and the old made young again. 2. 1603 - Martin Pring, famous explorer, first known white man to walk the sands of the beach. 3. 1636 - Thomas Rogers of Salem, Mass., first settler. Plants apple trees, pears, near the rocks, near the middle line (Union Ave.). Attests a deed in court in Saco - 1636. Trudges the sands of the beach to court Esther Foxwell of Pine Point. 2nd Sawmill in Colonies - 1645. On "Foxwell's Brook" - present "Cascade". Ocean Park called "Peter Paige's Plains". 4. Sept. 1675 - Sokokis Indians attack and burn Rogers' home. Rogers' family flees to Kittery. "Rogers-Gardens-by-the-sea become silent and desolate for 42 years. 5. Oct. 1675 - "Battle of Googins Rocks" Capt. Wincoll of Kittery and 11 militia men marching on the seashore to aid settlers at Pine Point are attacked by 150 Saco Indians. By hiding behind the rocks successfully drive the Indians off without the loss of a single man, even though the tide is rising. 6. 1680 to 1722 - "Rogers Gardens" are silent and deserted as a reminder of the Indians' wrath and the reference to the "Old Orchard" is established. Rogers trees still standing 100 yrs. 7. 1722 - Patrick Googins is the first permanent settler. Arrives with his bride Mary Rogers. 8. 1775 - 1783 - The men of Old Orchard march with the men of Scarborough in Col. Edmund S. Phinney's 18th Continental Regt. of Foot. John Googins killed at the battle of Hubbardtown on July 7, 1777. Margery Googins, 300 miles away in Old Orchard, experiences her son's death throes. James Means, Mozes Banks, Benjamin Milliken, Robert Patterson, Peletiah Foss, John and Stephen Googins serve in war. 9. 1780 - Great forest fires ravage all of York County, but the Old Orchard is untouched. Staples family arrives from Kittery and build "Staples Inn" in 1790. 1798 - First rumblings of discontent over bad roads with the Mother City of Saco. 10. June 1814 - Great crowds of men and boys here to watch landing of British Marines who burn & sack Biddeford Pool. British regard Old Orchard as a "Fort on the Hill" and do not attack. 11. 1821 - Old Orchard's first schoolhouse, a one room building that was on "A" Street. Moved and converted to a tourist cabin on Summit Street, where it still stands. 12. "Pars on Fairfield House" is the town's first hotel, complete with a bowling alley in 1820. Stage coaches bring Saco & Biddeford residents and the Staples farm is enlarged in 1837 to accomodate Canadians. 13. 1845 - "The Hermit of Old Orchard." Ned Clemens, forecasts that the Beach will become world famous. Edits first newspaper. Founded America's shore dinner industry here by holding first commercial clambakes on the beach. 14. One of the more historic homesteads, is the Milliken homestead, built in 1834 by C. Nason Milliken after having walked to Boston to learn the brickmaker's trade. Returned home on foot, made bricks and built the homestead. 15. Civil War 1861-1865 - Milliken family provides the Union Army with the youngest drummer boy from the State of Maine. Edward Milliken just turned 14 years. C. Fayette Staples; town's best known Civil War Veteran; local American Legion post named for him. Men of Old Orchard march with the men of Scarborough and serve in the 5th Maine Volunteers and the 11th Maine "Lawyers" Volunteer Infantry Regiment. 16. 1874 - The Railroad comes through Old Orchard. 3 railroad stations serve throngs coming to attend camp meetings. 10,000 people a day alight at the Camp Ground station. Many famous orators here; Henry Cabot Lodge, Thomas B. Reed. U.S Post Office established here. John L. Sullivan here every Sunday for clambakes. 17. 1875 - Ebenezer Staples sets the pattern for the future of Old Orchard as a famed summer resort by building the 300 room "Old Orchard House". A landmark that becomes synonymous with the beach. Torn down in 1943. 18. 1881 - Four large fires kindle the fires of Independence, and the seeds of separation are sown due to the City of Saco's failure to provide adequate fire apparatus or protection. Citizens band together and raise funds to purchase a fire bell. The bell serves as stimulus for efforts by the residents of the seashore at Saco, to separate from the Mother City of Saco. Ocean Park founded by the "Free Will Baptists" as a religious summer assembly by act of the State Legislature on January 24, 1881. Oren B. Cheney, first president of Bates College is instrumental in founding. 19. 1882 - 1883 - Edgar Yates, history teacher in Old Orchard is threatened by Saco officials for purchasing U.S. history text books for the school children of Old Orchard without permission of city officials. Yates felt that the taxpayers' children were entitled to equal education for equal taxes. Ebenezer C. Staples, town elder takes up the battle of Yates, and secures the signatures of 111 residents in petition to the State Legislature for the residents of the seashore at Saco to be "set-off". Staples elected one of town's first 3 Selectmen on his 75th birthday; donated steam fire engine to the town. 20. July 4, 1888 - Horse drawn trolley car services Old Orchard for the first time. First of the so-called "foreign element" arrive in town to take up residence as natives. Jos. Bernier the first Frenchman arrives in 1886, followed by Harold Hutchinson, Omer Bill, Timothy Crowley, Roxey Gifun, Mansey, Aires families also; later. Gradual influx of French-Canadian & Irish Catholic population from Saco-Biddeford begin arriving to be permanent settlers. 21. 1892 - First "merry-go-round" in the nation licensed here. The "mile running track" built, and establishes Old Orchard as the mecca of harness racing. C. Fayette Staples owns the first automobile in town, in 1895. 22. 1898 - The sinking of the Maine rallied only two men to the colors, Norris Marshall & J. Howland. The Yates, Porter, Staples & Milliken families band together financially and form the "Old Orchard Ocean Pier Company" and build a steel pier 1,800 feet out into Saco Bay, that becomes a familiar landmark of the beach. 110 residents petition to have Ocean Park returned to the city of Saco, but the petition is denied. Free Public Library founded. 23. 1900 - Town Hall built this year. Town meetings no longer held in "Odd Fellows Hall". Seaside Park built by Wesley G. Smith in 1902. President "Teddy" Roosevelt whistle stops here. 24. August 15, 1907 - "The Great Old Orchard Fire" burns many, many of the larger hotels on hotel row and chars 1/4 of the town. Ruins still smouldering in September. Heat is so intense trains stop at Atlantic Ave. & at Walnut Street railroad tracks shift and twist due to heat. The "Plush & Velvet" age comes to a blackened, smouldering, charred end. Flames were seen as far away as Sanford. Fire burns over to 25 West Grand Ave., then East to Barton Street; Milliken and Bradbury Street but strangely only burns one side of Old Orchard Street as far as the Butler House. 25. 1911 - 1914 - Automobile races are held on the sands of the beach in an attempt to revive the spirit of Summer Season. John Duffy assumes control of the pier and Whiteway, and the town rises from the ashes under drawing cards supplied by Duffy. Capt. Harry M. Jones flies the first unauthorized U.S. Mail, from Old Orchard to Kennebunk. 26. World War I 1917 - "The War to end all Wars." 52 of the young men of the town answer the call to the colors. None killed in action. Edward I. Lord is the town's youngest soldier, having just turned 16 years of age. A Municipal Fuel Yard is the town's answer to the fuel shortage and is a unique community effort unparalleled in Maine history. A roller coaster is added to the new wrinkles on the face of the town in 1914. 27. 1924 - 1929 - Trans-Atlantic Ocean flights are attempted from the sands of the beach. Frances Grayson, Clarence Chamberlin are among the many pilots here. "Lindy" visits in 1929. Such famous planes as "Old Glory, Pride of Detroit, Green Flash, Roma, Royal Windsor, The Dawn, Yellow Bird", all visit here. 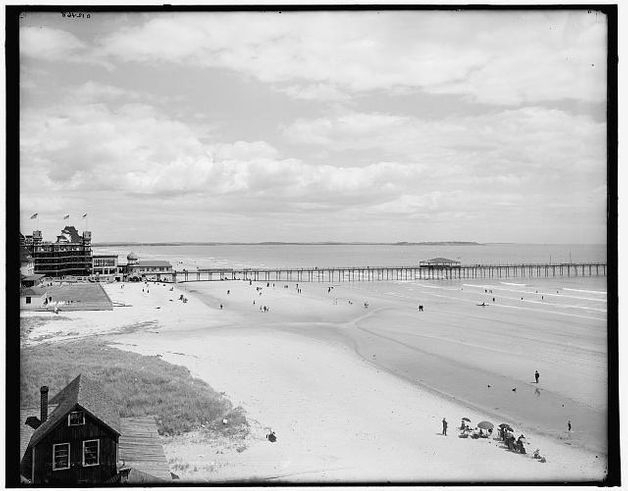 Name of the town officially changed to Old Orchard Beach on March 23, 1929. 28. 1930 - 1935 - Marathon dances, road races, W.P.A, R.W.A, C.C.C, all become very familiar and accepted part of the everday life of Old Orchard's Beach. Roller coasters, ferris wheels, balloon ascensions, and a general carnival atmosphere predominate the summer seasons. 29. 1935 - 1942 - The town builds a new High School in 1936. Many opponents state "that there will never be enough pupils to fill the place". Population rises from 2,255 in 1940 to 4,500 in May of 1942. Defense workers live year round in summer cottages. 30. World War II 1941 - 1945 - The War is brought close to the townspeople with the fall of Bataan & Corregidor where 3 Old Orchard boys are captured by the Japanese. Roger Verville and Gideon Abbot die as Prisoners Of War, and Robert Morse returns to us to become Postmaster. 538 youth of Old Orchard Beach rally to the colors and the town offers up 13 of her youth on the sacrificial altar of the War Gods. The streets of the town echo to the tramp of marching feet as Company "G" of the 181st Infantry Regiment patrol the beach against invasion and enforce the "Dimout". 31. 1947 - The town is rediscovered by the returning war veterans of the Biddeford-Saco area, who settle here. 47 stone houses are built at the "Halfway" section of town. Great York County fires this year blacken the skies and turn many towns into charred ruins but the Old Orchard remains untouched by flames, even though most of the male population fight fires all over the county. 32. 1950 - 1953 - Town Manager form of government instituted in 1950. In 1953, W.Warren Harmon retires as town meeting moderator after 25 years as Moderator. Town meetings are no longer held in the Town Hall which is a fitting tribute to the 25 consecutive years of service of Harmon. 33. 1954 - The whole town mourns the tragic fire that claimed the lives of the five children of the Whitcomb family. Strong men weep and the townspeople and organizations raise $6,000 and build a new home for the parents. Hurricanes "Carol" & "Edna" slam into town both in the same month. Water and electricity shut off in some sections for 2 weeks. Tall, majestic pines come crashing down and wreak havoc in town. 34. 1955 - Two new buildings are added to the face of the town as two Saco banks build branch offices; and an 11 ton War Memorial and library appear, as community spirit and pride. 35. 1955 - Fred I. Luce retires from public office after having served 45 years in public office. 43 years which were spent consecutively as Town Clerk. Luce also remembered for having set out 3/4 of the shade trees lining the streets and avenues of thee town. Luce began the plantings on Arbor Day of 1898. 36. 1956 - The citizens, disgruntled by high taxes, petition for a special town meeting seeking to overthrow the Town Manager form of government. Five special town meetings are called by the Selectmen to decide the issue and the citizens vote 4 consecutive times to abolish the Town Manager form of government. The vote of the fifth town meeting is accepted as valid by the Selectmen and the manager form of government is retained. Threats, curses, and fists fly fast and furiously. 37. 1957 - Fire Chief "Ted" Mingo retires after a half a century of service with the fire department, thus drawing to a close an era of the town's history, as the last of the elders of town fade from public office. High school basketball team a source of great pride as they capture Western Maine Championship.